Siso HK3W Amateur HamRadio "100% DX"
Introduction: FT4 is an experimental digital mode designed specifically for radio contesting. Like FT8, it uses fixed-length transmissions, structured messages with formats optimized for minimal QSOs, and strong forward error correction. T/R sequences are 6 seconds long, so FT4 is 2.5 × faster than FT8 and about the same speed as RTTY for radio contesting. FT4 can work with signals 10 dB weaker tan needed for RTTY, while using much less bandwidth. Basic parameters: FT4 message formats are the same as those in FT8 and encoded with the same (174,91) low-density parity check code. Transmissions last for 4.48 s, compared to 12.64 s for FT8. Modulation uses 4-tone frequency-shift keying at approximately 23.4 baud, with tones separated by the baud rate. The occupied bandwidth (that containing 99% of transmitted power) is 90 Hz. Threshold sensitivity for 50% decoding probability is S/N = –16.4 dB, measured in the standard 2500 Hz reference noise bandwidth. A priori (AP) decoding can push threshold sensitivity down to –18 dB or better. 1. Download the installation package from a link to be provided. 2. Install the program in the usual way for your operating system. To avoid conflicto with your normal operation, you may wish to use a different installation directory from that used for WSJT-X 2.0. 3. Start the program as you normally would for FT8. 4. From the Configurations menu select FT8 | Clone (or Default | Clone). 5. Rename the resulting new configuration to FT4, and select the new configuration. 6. Select FT4 from the Mode menu. 7. On the File | Settings | Frequencies tab, right-click any line in the Working Frequencies table and press the Reset button. This action will pick up the recommended working frequencies for FT4. 8. Check the box Special operating activity on the Settings | Advanced tab. Then select RTTY Roundup messages and enter your proper contest Exchange in the field RTTY RU Exch. You now have a release candidate for WSJT-X 2.1.0 configured for FT4 operation. You might find it useful to download and examine an FT4 sample file. Select Download Samples from the Help menu and tick the FT4 box. Configure the Wide Graph controls as shown in Figure 1 and select Deep on the Decode menu, then open the sample file from the File menu. The recorded interval should produce 19 decodes, as seen in Figure 1. Most of the decoded signals are inaudible or barely audible in the audio file. Fewer than one-third are strong enough to be reliably decoded if they had been RTTY signals — and only then if they were spread out over a much wider frequency range. Operation: Aside from its much shorter T/R sequences, FT4 behaves essentially the same way as FT8. One new on-screen control is available for FT4 operation, a button labeled Best S+P, just below the Call 1st checkbox. Clicking this button during an Rx cycle arms the program to examine all CQ messages decoded at the end of the 6- second Rx sequence. The program will select the best potential QSO partner (from a contesting perspective), and treat it as if you had double-clicked on that line of decoded text. Here “best potential QSO partner” means “New Multiplier” (1st priority) or “New Call on Band” (2nd priority). “New Multiplier” is currently interpreted to mean “New DXCC”; a more broadly defined multiplier category (for the ARRL RTTY Roundup rules) will be implemented soon. We may also provide additional priority rankings, for example “New Grid on Band” (useful for North American VHF contests), sorting by signal strength, etc. For keyboard control of transmitted messages, check the box Alternate F1–F6 bindings on the Settings | General tab. In typical contest-style operation you can then hit function key F1 to solicit a QSO by sending CQ. To respond to a CQ and send your contest exchange, double-click on the decoded message. Alternatively, you can click on Best S+P and let the selection algorithm choose a station to call. Auto Seq and Call 1st checkboxes behave as in FT8, and thus the remainder of a minimal QSO can continue without further operator action. Function keys F2 – F5 may be used to send messages displayed in entry fields for Tx2 – Tx5 on tab 1, at bottom right of the main window. Function key F6 toggles the checked status of Call 1st, and key combination Alt+B can be used to toggle the armed status of Best S+P. FT4 is presently configured so that a station operating in Search-and-Pounce (“S+P”) mode logs a QSO when RR73 is transmitted, and the CQing (“Run”) station logs a QSO when RR73 is received. Like FT8, FT4 makes little distinction between an S+P station and a Run station. An operator can switch easily and frequently between these two ways of initiating QSOs, and contesting skill will depend on optimizing these and many other operating decisions. With a steady stream of available stations to work, singleradio QSO rates well above 100/hour are possible using FT4. Transmitted signal: FT4 uses a modulation technique known as Gaussian frequency shift keying, or GFSK. The generated audio waveform consists of 105 symbols (tones) sent in sequence at one of four frequencies. The encoded series of distinct tones for part of a transmission might originally look like the upper (red) curve in Figure 2. However, in FT4 the sequence of frequencies is smoothed by convolution with a Gaussian function before being sent to the software modulator. The blue curve shows the corresponding smoothed sequence of frequencies actually sent to the modulator. The transmitted sequence no longer has any stepwise discontinuities. Differences between the red and blue curves seem rather small, but spectra of the resulting audio waveforms are remarkably different. 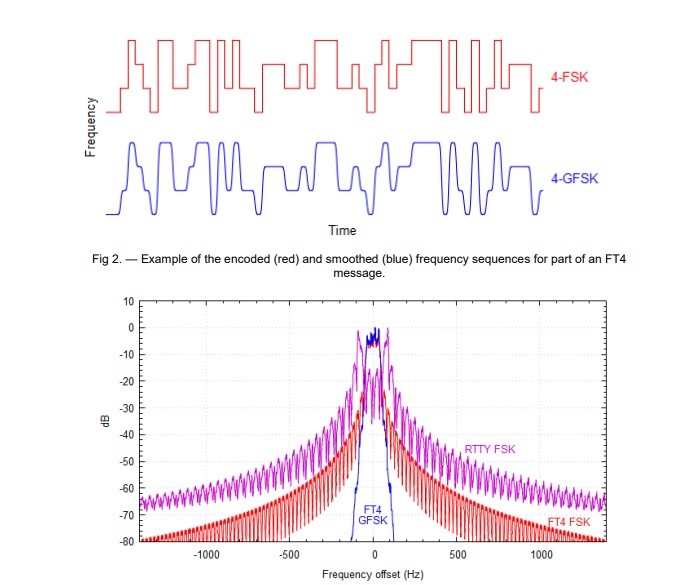 Figure 3 shows spectra for an FT4 signal (blue) and a standard continuous-phase FSK sigal (red) for the same encoded bit sequence. The GFSK spectrum has steep skirts, occupying a bandwidth of only 75 Hz at –6 dB, 200 Hz at –60 dB, and 260 Hz at –80 dB. No additional filtering is applied to the audio waveforms. Figure 3 also shows the spectrum of a standard RTTY signal (purple), which is more than 2000 Hz wide at –60 dB. Some ham software generating RTTY signals by audio frequency shift keying (AFSK) offers optional filtering of the waveform to reduce the unwanted keying sidebands. However, such post-modulation filtering necessarily destroys the constant-envelope nature of the continuous-phase FSK signal and leaves behind a waveform that must be amplified with good linearity to avoid generating new unwanted sidebands. In contrast, the GFSK signal of FT4 has a constant envelope and is immune to inter-modulation distortion. Decoding and Frequency Usage: The FT4 decoder in WSJT-X 2.1 identifies and decodes signals anywhere in a passband up to 5 kHz wide. As in other WSJT-X modes, received messages are “all or nothing” — there are no partial decodes, and false decodes are rare. Subtraction of decoded signals from the received data stream enables decoding of transmissions that overlap in frequency with other, possibly much stronger signals. The last three decodes shown in the Band Activity window in Figure 1 are examples of such second-pass decodes. With the normal odd/even sequencing of transmissions and signals spaced at intervals 120 – 150 Hz, as many as 50 stations can operate in a 3 or 4 kHz passband with little interference, even when signal strengths differ by as much as 60 dB. 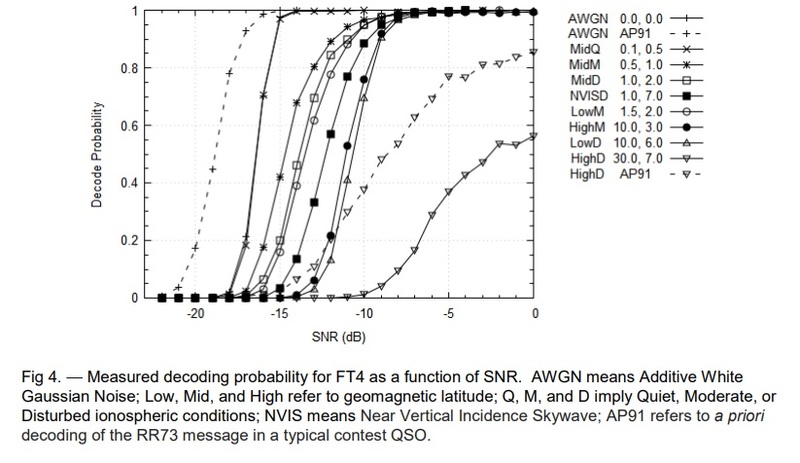 Experience will tell what may be the best strategy for selecting dial frequencies during contests, and for how many ~3 kHz segments should be used for FT4 on each band. As initial guidelines we suggest the following default dial frequencies for FT4: 3.595, 7.090, 10.140, 14.140, 18.104, 21.140, 24.919, 28.180, 50.318, 144.170 MHz. We will welcome any feedback that could lead to better frequency choices. that a much larger fraction of received signals are decodable, especially in contest-like operating conditions where a given station may transmit roughly half the time. In terms normally used for communications engineering, synchronization increases channel capacity. Random concluding thoughts: FT4 is a special-purpose mode designed for rapid-fire contest QSOs. It serves this purpose very effectively, but like FT8 the mode is not useful for more extensive conversations. 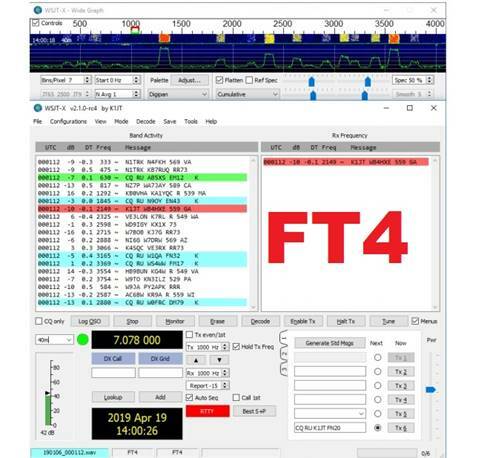 FT4 uses much less bandwidth than RTTY and provides reliable decoding at much lower signal levels. It has no need for “Super Check Partial” or similar contesting aids, and skilled operators using FT4 will find less motivation to use a DX Cluster or other non-radio aids. All information necessary to score well in a contest can be obtained over the air, during the contest, through one’s own antennas and radios. With FT4 there is little distinction between CQ and S+P operation, so it’s easy to switch frequently between the two ways of finding QSO partners. Stations using low power and compromise antennas can participate effectively in a contest using FT4.